I pray for divine direction and an interest in your faith and prayers as I express the convictions of my soul this morning. 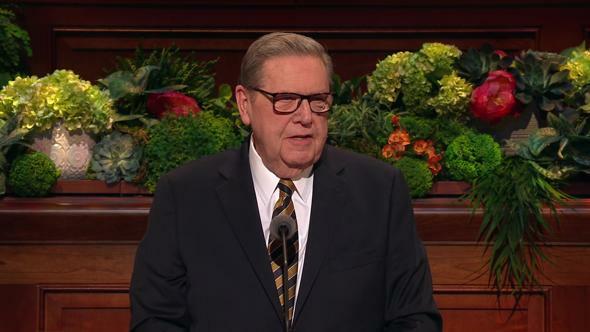 We are all so pleased to have President Kimball here looking so well and blessing us with his inspired counsel and direction. 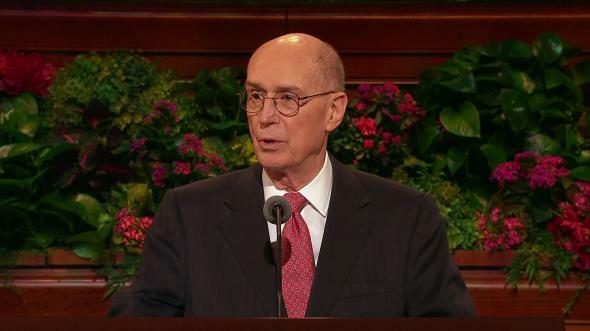 The world loves and honors our prophet, but the Saints love him even more. This is a glorious time of the year, the newness of springtime—an opportunity for each of us to reappraise our spiritual understanding and commitment, to rejoice in the glory of the resurrection of our Lord, and to feel of his anxious love for all mankind. Probably nowhere did Jesus find more needed rest and happier hours than in Bethany in the quiet house of that family whom, according to John, he loved (see John 11:5). This small village with this very special family was just outside Jerusalem on the eastern slope of the Mount of Olives. The family evidently consisted of Martha, Mary, and their brother, Lazarus. This quiet village, though only two miles from Jerusalem, was completely hidden from the bustle of the crowds and must have fed the soul of Jesus with love and peace. He must have felt welcome to share this family’s hospitality. They not only furnished comfort but listened in deep conviction to his words. While Jesus was about his ministry he received a solemn message that he whom he loved was sick (see John 11:3). Lazarus was Jesus’ intimate personal friend outside the circle of Apostles. The scripture account tells us Jesus did not leave at once in response to the request because he was occupied with his important work, but he sent word that he would come. Four days later when Jesus arrived at Bethany he stayed outside the little village, the record tells us, inasmuch as a large number of people, including distinguished Jews, had assembled to comfort and mourn with Mary and Martha. The sisters undoubtedly were disappointed in the Savior’s delay. “Lord,” said Martha, “if thou hadst been here my brother had not died” (John 11:21). The Savior’s brief reply undoubtedly brought comfort to Martha and rings out in hope to all the world: “Thy brother shall rise again” (John 11:23). Martha, we assume not thinking it possible for her brother to be awakened from the sleep of death, answered, “I know that he shall rise again in the resurrection at the last day” (John 11:24). “And whosoever liveth and believeth in me shall never die. Believest thou this?” (John 11:25–26). Martha’s deep faith supplied the answer, “Yea, Lord: I believe that thou art the Christ, the Son of God, which should come into the world” (John 11:27). Martha, after having borne this strong witness, found Mary, who, hurrying to Jesus in agony as had Martha, said, “Lord, if thou hadst been here, my brother had not died” (John 11:32). These were his friends. These must have been moments of tender compassion for Jesus and, undoubtedly, of deep emotion and wonderment for all who witnessed. Jesus said, “Where have ye laid him?” They said, “Lord, come and see” (John 11:34). His enemies, some of whom were there, were asking whether he who had opened the eyes of the blind could not have saved his friend from death. Jesus surely knew their thoughts and would have heard their comments as he viewed the crowd with its hired mourners. The burial tomb, typical of the time, probably was a recess cut in the rock with a stone over the entrance. Jesus asked that the stone be removed. He stood at the entrance and called, “Lazarus, come forth. There were many witnesses to this miracle who believed, but there were others who would carry an alarming story to the Sanhedrin at Jerusalem. As Jesus’ fame grew, so grew the opposition from the chief priests, apprehensive that he would undermine the established order. And Jesus going up to Jerusalem took the twelve Apostles aside and said unto them: “Behold, we go up to Jerusalem; and the Son of Man shall be betrayed unto the chief priest and unto the scribes; and they shall deliver him to the Gentiles to mock and to scourge and to crucify him. On the third day he shall rise again” (see Mark 10:32–34). In an upper room, Jesus and his Apostles were together for the last time. He taught them, saying, “Verily I say unto you, that one of you shall betray me” (Matt. 26:21). As they were eating, Jesus took bread and blessed it and broke it and gave it to his disciples, saying: “Take, eat. This is my body which is given for you: this do in remembrance of me” (see Matt. 26:26; Luke 22:19). After this manner also he took the cup, saying, “This is my blood of the new testament, which is shed for many for the remission of sins,” thus establishing the pattern for the sacrament as a sacred ordinance in his church (Matt. 26:28). In Gethsemane Jesus knelt in prayer and poured out his soul. “O my Father, if it be possible, let this cup pass from me: nevertheless not as I will, but as thou wilt” (Matt. 26:39). “And being in agony he prayed more earnestly: and his sweat was as … great drops of blood falling … to the ground” (Luke 22:44). Following his betrayal, and when the morning was come, the chief priests and his enemies took counsel against Jesus to put him to death, and they bound him and led him to Pontius Pilate, the governor, “and when he had scourged Jesus, he delivered him to be crucified” (see Matt. 27:1–2, 26). He was taken to Calvary. At the third hour, they crucified Jesus, and with him they crucified two thieves (see Mark 15:25, 27). “And there was … darkness over all the earth until the ninth hour. “… and the veil of the temple was rent in the midst” (Luke 23:44–45). After three days, very early in the morning on the first day of the week, the women came to the sepulcher with spices to anoint the body of Jesus. Instead, they were greeted by a young man in a long white garment who announced: “He is not here. He is risen” (see Luke 24:6). Jesus showed himself first to Mary Magdalene and afterward to the Apostles. For forty days after his resurrection, Jesus remained with his disciples to instruct them more in the gospel. He told them, “Go ye into all the world, and preach the gospel to every creature” (Mark 16:15). And then “he led them out as far as … Bethany, and he lifted up his hands, and blessed them,” and “while he blessed them, he was parted from them, and carried up into heaven” (Luke 24:50–51). “Which … said, Ye men of Galilee, why stand ye gazing up into heaven? this same Jesus, which is taken up from you into heaven, shall so come in like manner as ye have seen him go” (Acts 1:10–11). We testify to all the world, as did the Apostles of old, that this same Jesus taken up into heaven as men watched, will return—will return in power and great glory, attended by the hosts of heaven. At that day “the glory of the Lord shall be revealed, and all flesh shall see it together” (Isa. 40:5). But prior to that day, as foretold by the prophets, there must be a restoration of all things in the last days, the fulness of the gospel with all its saving powers to be returned to earth (see Acts 3:20–21). 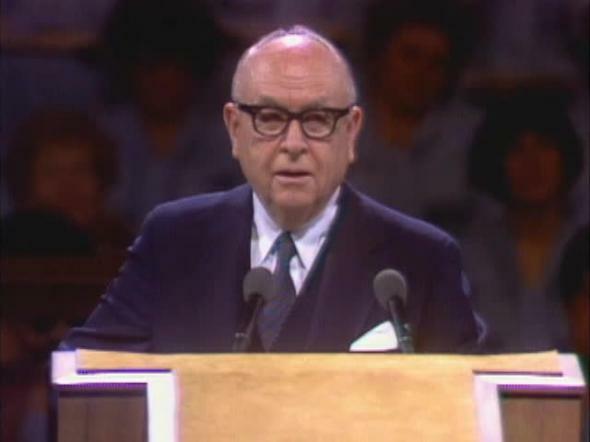 We proclaim with knowledge and power as witnesses of heavenly events that the final great restoration has taken place, that angelic ministers have been sent from heaven, that God’s voice has been heard declaring its truth, that the gift of the Holy Ghost and the priesthood powers with blessings and promises have again been given to man. Tomorrow, the day selected to remember the resurrection of our Lord, is an occasion of additional joy and humble thanksgiving. Not only the organization of Christ’s church was reinstituted on that day 150 years ago, but the Lord has protected, sheltered, and prospered it through these challenging years. God has held it in the palm of his hand. The Prophet Joseph Smith’s account of the first organization meeting is inspiring to read and contemplate—the Whitmer home, the opening prayer, approval to organize the Church as commanded, Joseph and Oliver Cowdery ordained elders, the sacrament; and then all members present were blessed with the gift of the Holy Ghost. There was prophecy and rejoicing. The events of that April 6, 150 years ago, had been directed by God. Members used their full agency in consenting to the organization, and the Holy Ghost bore witness to their souls that what was done was acceptable to the Lord. Then followed the trying and dramatic events of Kirtland, Zion’s Camp march, Haun’s Mill, Liberty Jail, the expulsion from Nauvoo, the tragedy at Carthage, Winter Quarters, handcart brigades, and Johnston’s army—the testing of a people, the trials of faith, but always the undergirding faith and belief in our Savior and his promise to Joseph, “If thou endure it well, God shall exalt thee on high; thou shalt triumph over all thy foes” (D&C 121:8). The motivating force behind the sustaining and vigorous growth of the Church is that it is true. It is God’s plan. 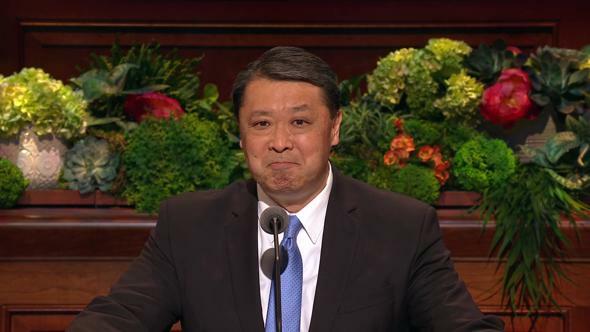 The gospel provides the only way to a mortal life of happiness and a joy forever. “We have no state church in America,” replied Dr. White. Dr. White explained to Tolstoy that in America each person is free to belong to the particular church in which he is interested. Tolstoy continued, “There have been great movements started in the past but they have died or been modified before they reached maturity. If Mormonism is able to endure, unmodified, until it reaches the third and fourth generation, it is destined to become the greatest power the world has ever known” (see Improvement Era, Feb. 1939, p. 94). It is not only destined to become but is the greatest power in the world. I thank God for his revelations to his prophets, past and present, and for not leaving us alone. I declare to you, my friends everywhere, my witness that God does live, that he made us in his own image, that he sent his divine Son, our Savior, to show us the way. I know that my Redeemer lives and pray that his blessings and peace may come to all men everywhere, in the name of Jesus Christ, our Lord and Savior, amen.